Home » Ecosystems » Why did the dinosaurs die? Dinosaurs remain one of the most mysterious species ever found through fossils, as we study the history of our planet. When we explore our past we realize that it is immense. Billions of years separate us from the beginning of life, while millions of years separate us from the death of the dinosaur species. What happened then? Why did dinosaurs die? It is generally accepted that dinosaurs disappeared through a sharp change in the ecosystem 66 million years ago. Many plants and large species died from climatic variation, cooling and warming. Dust in the atmosphere made sunlight unavailable. What brought this dust? Since the 1980s the common view is that an asteroid hit the earth. Scientists found an impact in the Yucatan region of Mexico that is several hundred miles wide, and the dating of this impact coincides in time with the loss of the dinosaur species. This crater is named Chicxulub. It is difficult to imagine the impact of a meteorite crashing into the earth, and creating a fallout of 70 billion metric tons of dust, the equivalent of 211,000 Empire State Buildings. This is the recount by Thomas Sumner in the February 2017 edition of the magazine Science News. With the help of computers, scientists can now measure the diameter and depth of the crater, and make a model of what happened. It looks like an endless night for two years. The atmosphere became so clogged around the entire earth that sun rays could not get through. The consequence: a cool down of 16 degrees Celsius around the globe with Arctic ice spreading to many areas southward. It is possible that species got literally buried alive under the fallout. 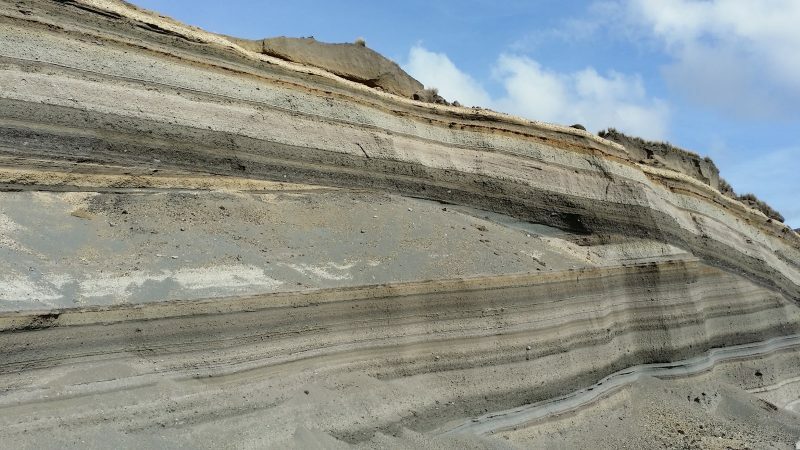 Layers of sediments near a volcano. New findings come from fossils collected after drilling into the Chicxulub crater, and finding animals buried alive. This, according the supporters of the crater theory, supports the notion that dinosaurs and fish were alive at the time of the impact, as scientists found debris of the impact inside the animals’ lungs: they inhaled the debris. If they were already dead at the time, lungs would be clear of the specific compounds. According to Jan Smit, sedimentologist, “I was 99% sure that it was the impact, and now that I’ve found this evidence I’m 99.5% sure“. But as Sumner notes, around the same time – 500,000 years earlier, sustained volcanic eruptions in the Deccan region released significant quantities of CO2, which had a warming effect into the atmosphere up to 7.8 degrees Celsius. Part of the scientific community thinks that the asteroid did not do the cleanup work on its own, but rather, species were struggling before that and that extinction from excess CO2 was already in progress. The planet would have essentially have gone from normal to unbearably hot, followed by the two years of extreme cold from ashes in the atmosphere. The challenge is the dating of volcanic activity, which continued and possibly increased at the same time, or possibly after the Chicxulub impact. Both events likely contributed. As much as this marked the end of the dinosaurs and anything larger than a beaver, smaller creatures made it through these tough times. This in turn, cleared the way for mammals to develop.